1. 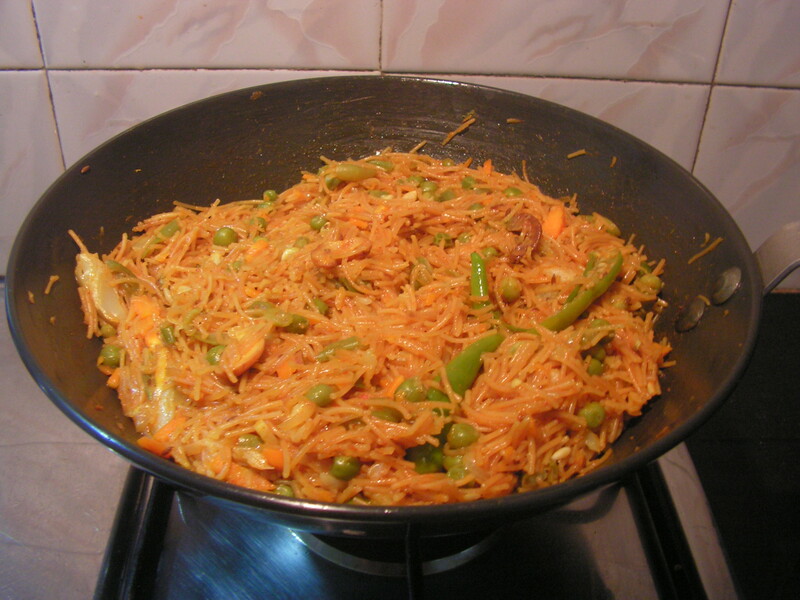 Place a skillet with vermicelli in it and warm it up for about 5- 10 minutes on low heat. 2. 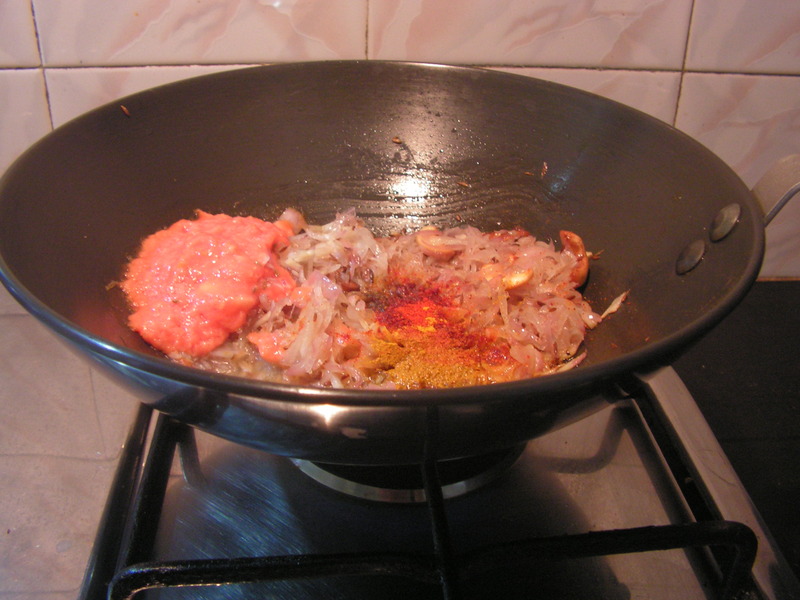 In the same skillet, warm up sugar on medium flame in such a way that it crystallizes and does not liquify. 3. 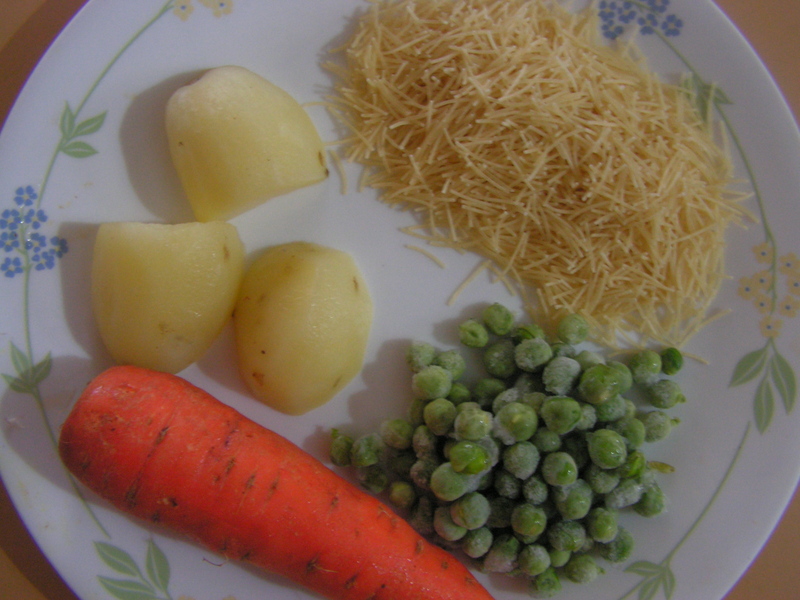 Both roasted Vermicelli and sugar is as shown in the image below. Add peeled cardamom to roasted sugar. 4. 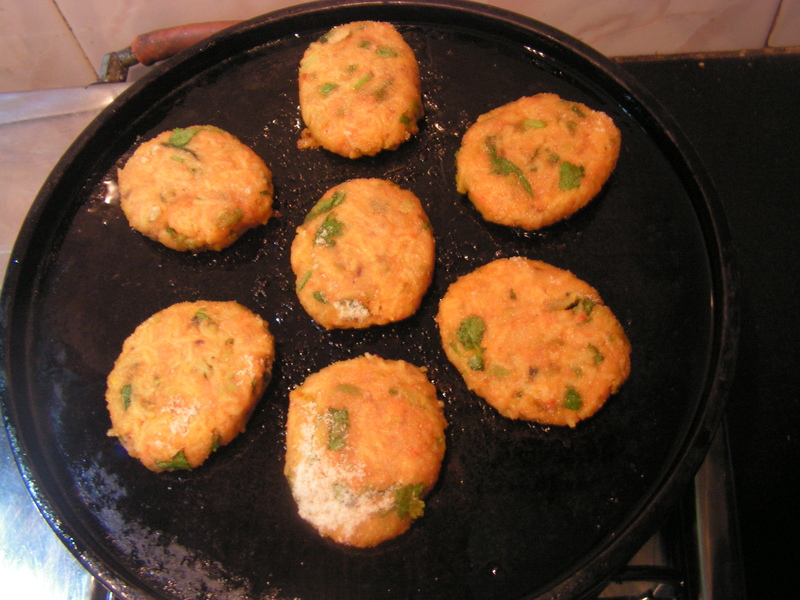 Place a frying pan with a little ghee in it and fry grated cashews till brown and crispy too..
5. On cooling, powder roasted vermicelli and sugar in the mixer to a fine consistency. 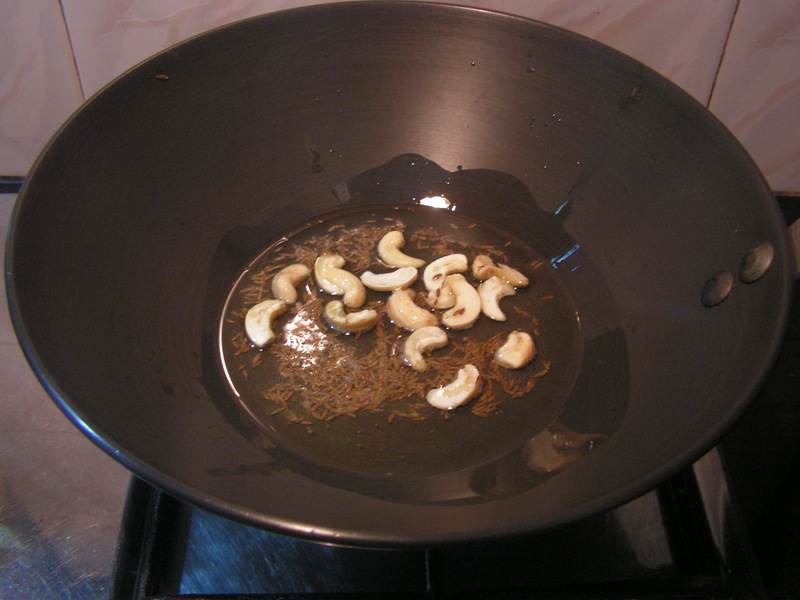 Add fried cashews from step-4 and add pure ghee as well. 6. Mix the laddoo mix well with your hands, bind it to laddoos. If difficult one can even add a little melted ghee to it and bind it into laddoos. 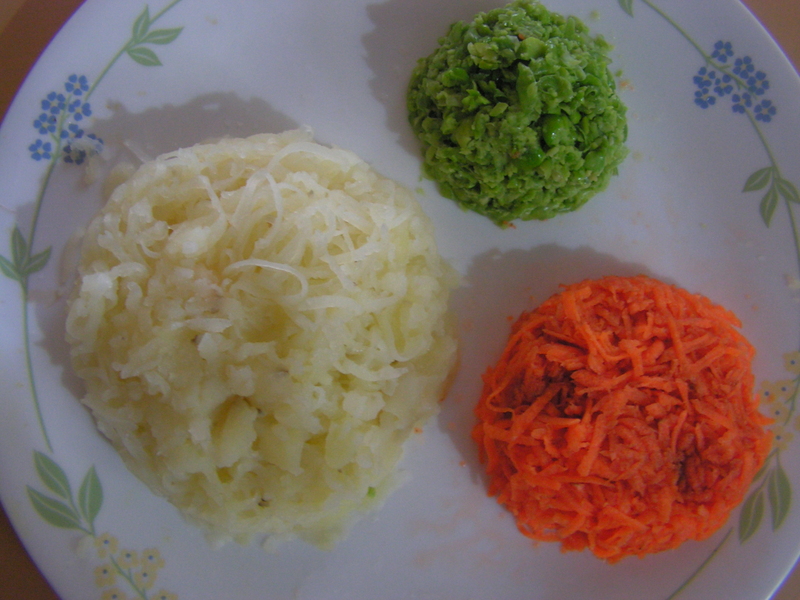 The laddoos are tasty and one will not even be able to recognize the semiya / vermicelli in it unless otherwise told ! Yummmmmmmmmmmmm…!!! 1. If pre-roasted vermicelli is used for the dish it should only be warmed up so that it will retain crispiness. 2. Sugar should be crystalized to help bind the laddoos. 3. Cashews are texture to homogenize with vermicelli texture and make for relishing laddoos. 4. Binding is a bit difficult since vermicelli does not have the dependable stickiness. 5. Use fresh ghee as far as possible. This entry was posted in Uncategorized and tagged 30 minutes, Festival food, Festivals, Laddoos, Semia, Semiya, Sevaiyan, Sweets, Vermicelli. Vermicelli or Semiya / Sevaiyan are the extremely thin noodles/angel hair/ spaghetti available in various brands like the Bambino, M.T.R and some local brands too. Previously we had to roast it before making any dish, but these days they come in pre-roasted packets. 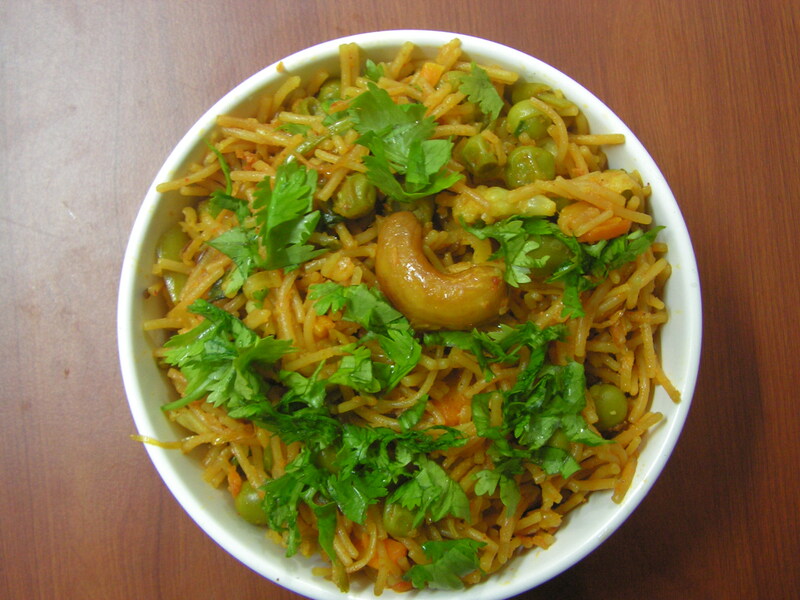 I have previously put up concoctions of vermicelli like the upma, pulav, and kheer. Today, I would like to put up yet another dish with this wonderful ingredient. 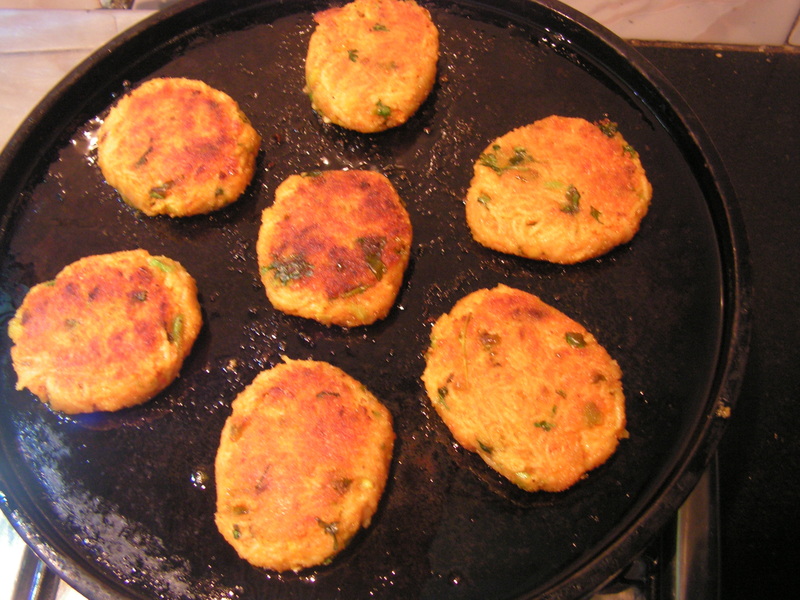 I have already put up vegetable cutlet, snake gourd cutlet, drumstick blossoms cutlet and today I present the Vermicelli cutlet which really tastes yum with either tomato ketchup or the pudina chutney. Here it is. 1. Wash, peel and chop onions fine. Wash and chop cilantro fine and keep it aside as shown in the above image. Peel garlic, ginger and make the paste too. 4. 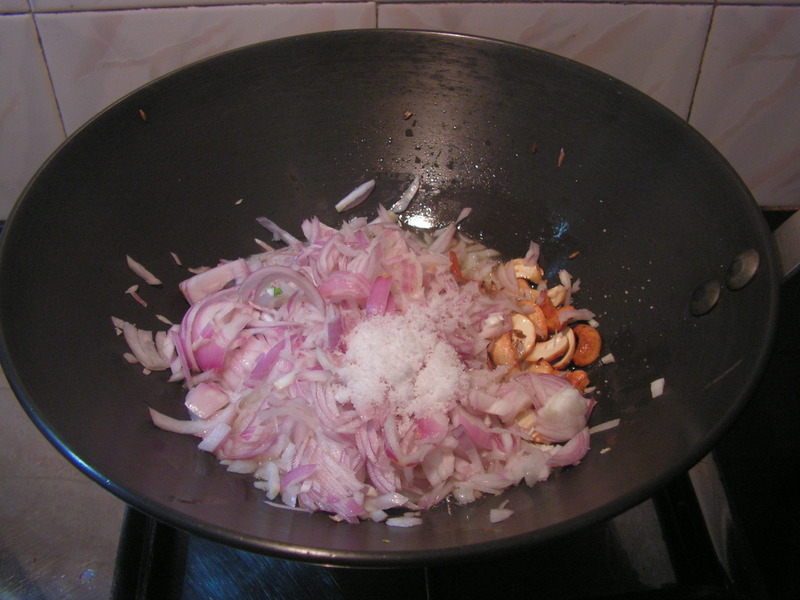 Place a skillet with 1 tablespoon of cooking oil on medium flame and add cumin seeds. When it splutters add chopped onions from step-1 and also required quantity of salt to it. 5. When done add ginger-garlic paste from step-1. Fry it till the raw smell disappears and nice aroma oozes out. 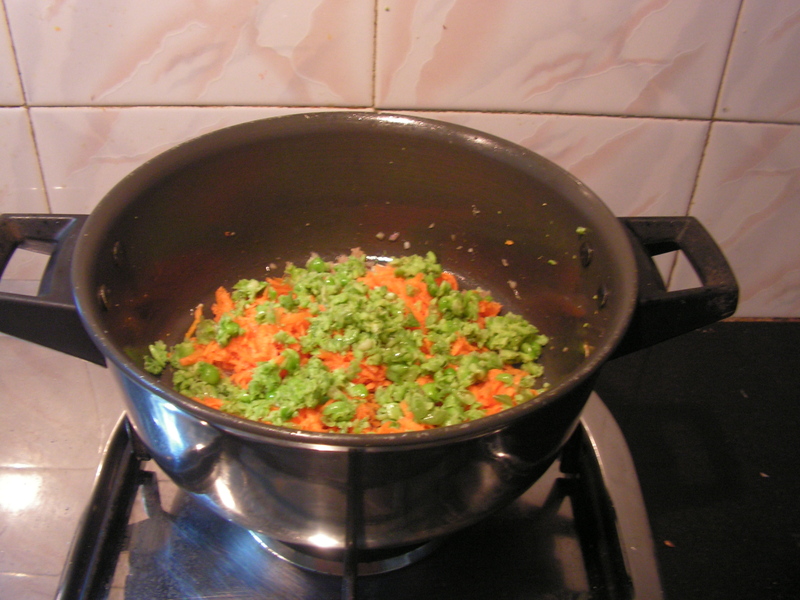 6.Add grated carrot and green peas as well to it and cook till done on low flame closing it with a lid and stiring at regular intervals so that it does not burn. 7. Finally add all powders and stir well. 8. 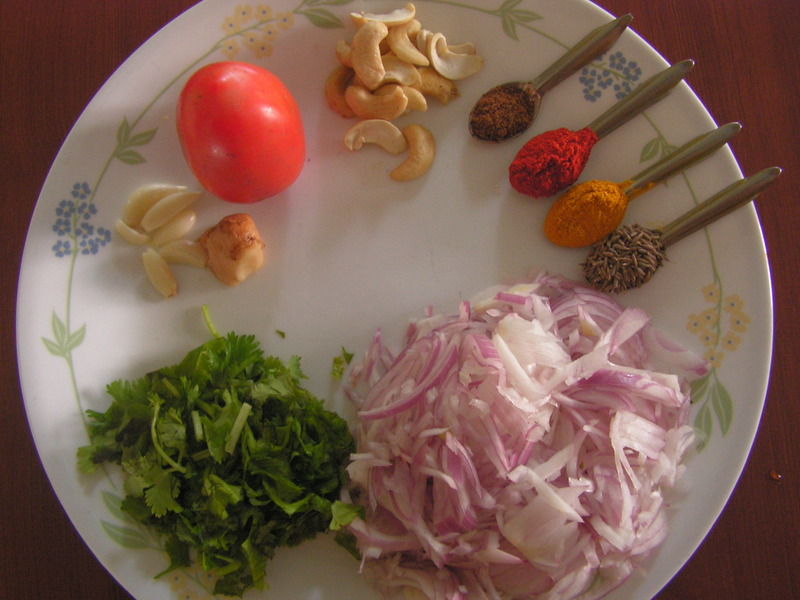 Transfer it to a broad based bowl along with cooked vermicelli, chopped coriander leaves and grated cooked potatoes. Add a pinch of sugar and lemon juice to it and mix well with your hands to bring it to a required consistency. 9. Mix well with your hands and shape it to ones requirement. Powder a few toast in the mixer to a medium coarse consistency and just dust the shaped cutlets in it. 10. 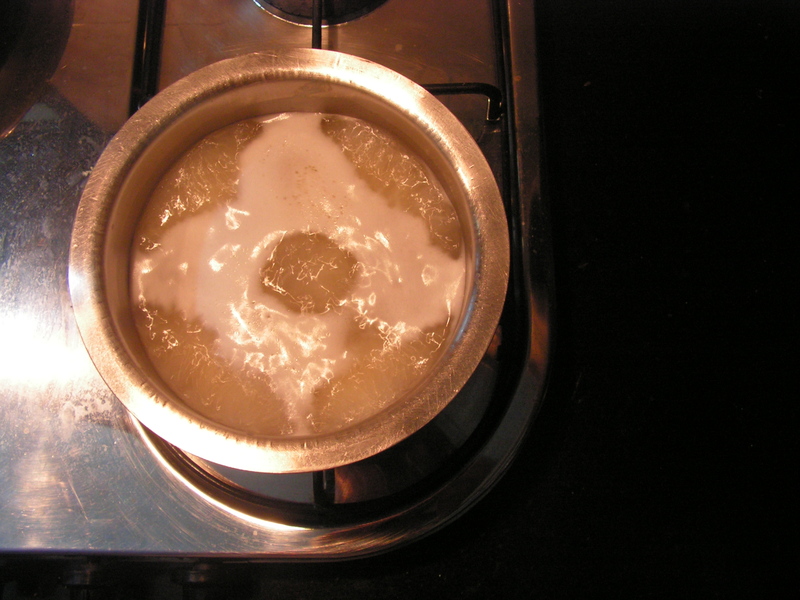 Place a dosa tawa on medium flame and splash a little oil on it. When heated place dusted cutlets from step-9 on it. Fry till the bottom of the cutlets turn crispy. 11. Flip and roast the other side as well splashing generous quantity of oil till crispy and is ready to serve now. 12. 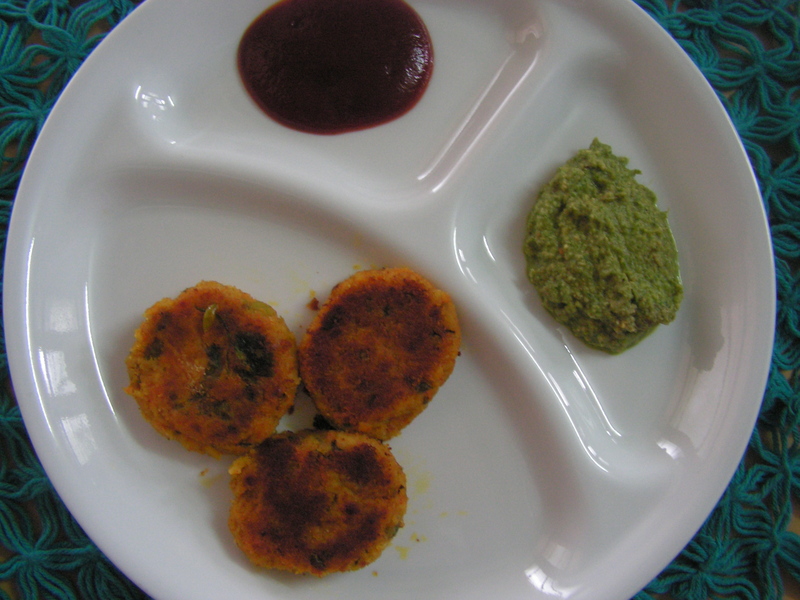 Enjoy with either Pudina chutney or Tomato sauce. 1. Always use fresh veggies for flavour and colour. 2. 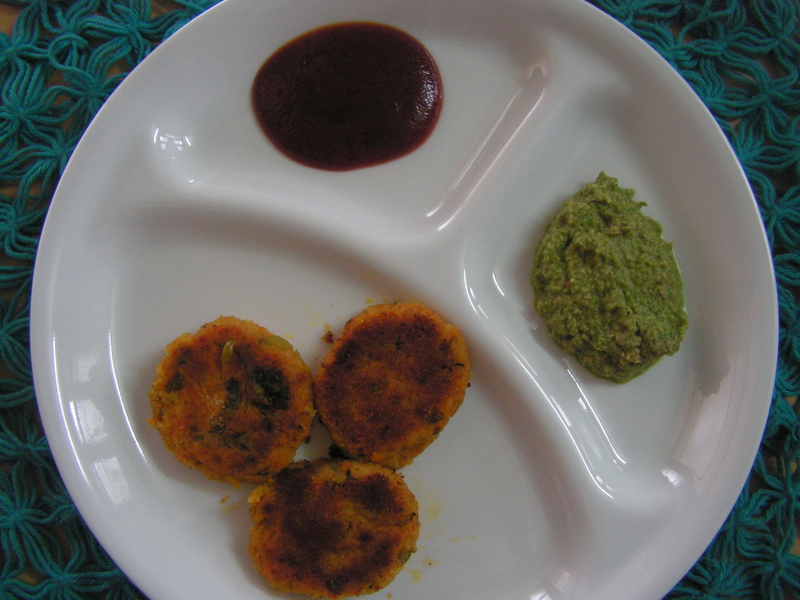 One can use veggies like cauliflower, beans etc as well if available in your pantry. 3. One can even microwave them if urgent. This entry was posted in Uncategorized and tagged Cutlet, Fried food, Fried snacks, One hour, Party dish, Semia, Semiya, Sevaiyan, Shevige, Spicy snacks, Vermicelli. 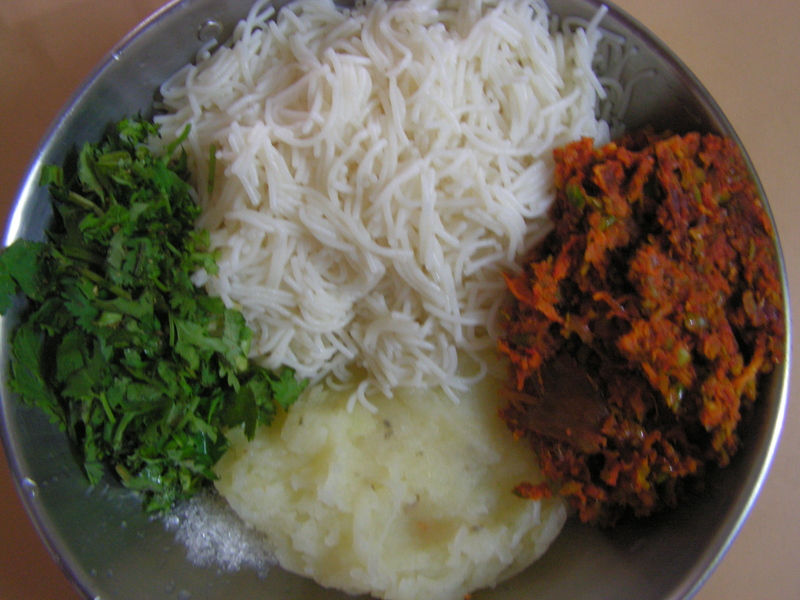 Vermicelli/Shevayi/Shavige – thats English, Konkani and Kannada respectively. It is available in a wide range in different brands and some of them is sleek and some are a little thick. Especially for kheer we prefer to opt only the sleek variety, since on being cooked it turns very thick and will not taste great. I normally prefer the Bambino brand vermecelli. Kheer can be prepared in combination with either Sujee, Basumati rice or even split greengram Dal. Today I would like to put up vermecelli kheer with sujee and it is an easy recipe which can be prepared instantly. 1. Place a skillet with 1 teaspoon pure ghee in it on medium flame. Add vermecelli to it and fry for a while stiring continuously. Add sujee to it and fry it together till sujee is done. 2. On cooling transfer it to another plate. 3. Place a wide bowl with 2-3 cups of water in it on the flame and when it boils, add vermecelli-sujee mixture from step-2 to it and when is half done add milk to it and let it cook till done. 4. When the mixture is cooked to a smooth consistency add sugar to it and bring it to boil on a low flame. Add saffron to it. 5. Place a spatula with 1 teaspoon pure ghee into it on low flame. Fry cashews till light brown. Add it to kheer. 5. Left over kheer can be pushed into the refregerator and one can even add grated cashews and pista and serve the same adding a little milk cream and sugar. Since one has added sugar and mlk cream the colour of kheer will be white. This entry was posted in Uncategorized and tagged Kheer, Payasam, Semia, Semiya, Sevaiyan, Shevige, Sweets, Vermicelli. Every one would like to try something new every once a while, especially on weekends when there is more time for something elaborate or something that requires more effort if you are trying the first time. Shevige Biryani is one such dish I recommend you try if you have not already. This biriyani is one of the favourite dishes of my younger son Sharath and mine as well. 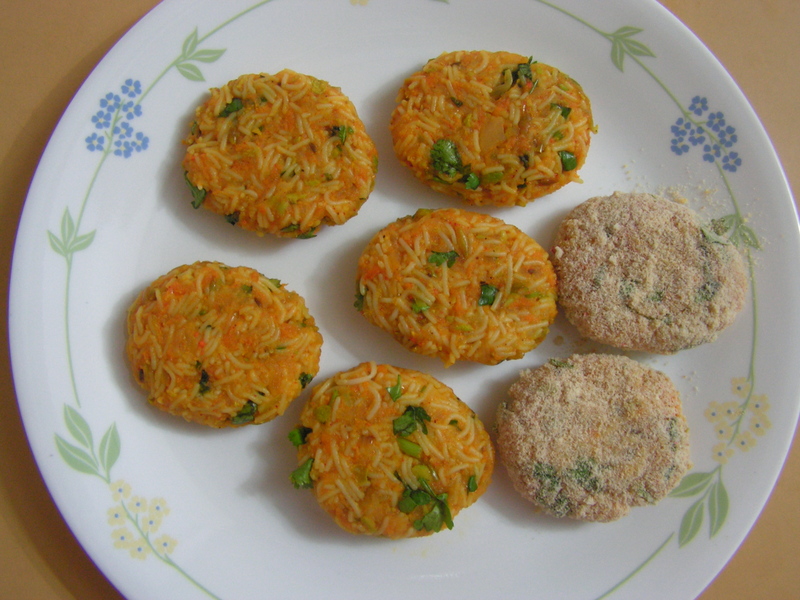 Unlike the usual Rice Biryani this is easier to prepare and as such is made during functions and parties. I first saw this at Hotel Diana in Udupi. I always prepare it with the Bambino or the M. T. R. brand vermicelli since both of them are very thin and on cooking they turn out finer. 1. 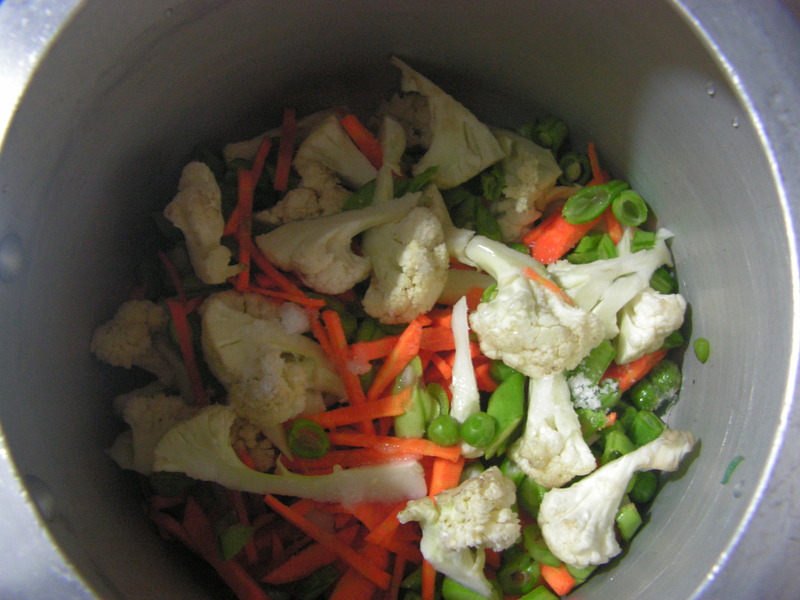 Wash and chop Beans, cauliflower, carrots and keep it aside as shown in image-1. Also peal and chop onions lengthwise, peal garlic pods too and wash and chop cilantro too and keep it aside. 2. Cook the chopped veggies in the cooker adding a little salt so that it is not over cooked for only 10 minutes. 3. 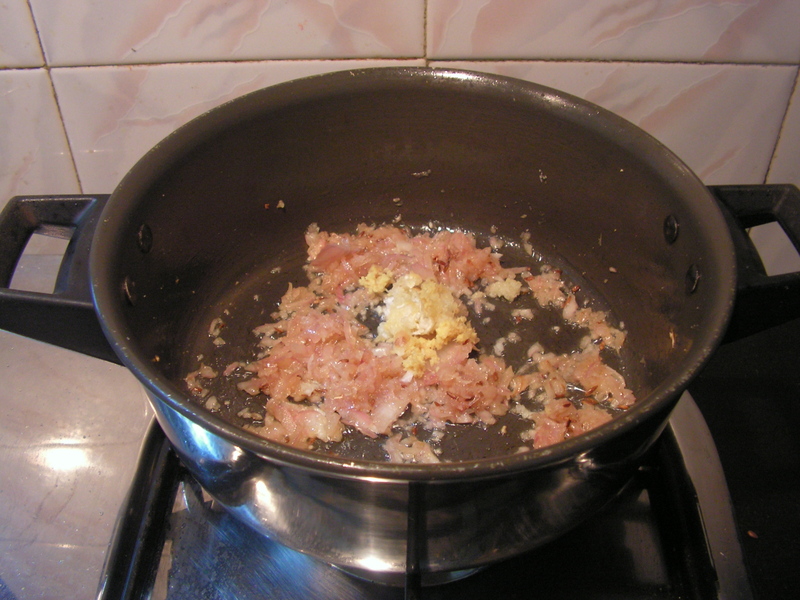 Place a skillet with 3-4 teaspoons of cooking oil in it on medium flame. 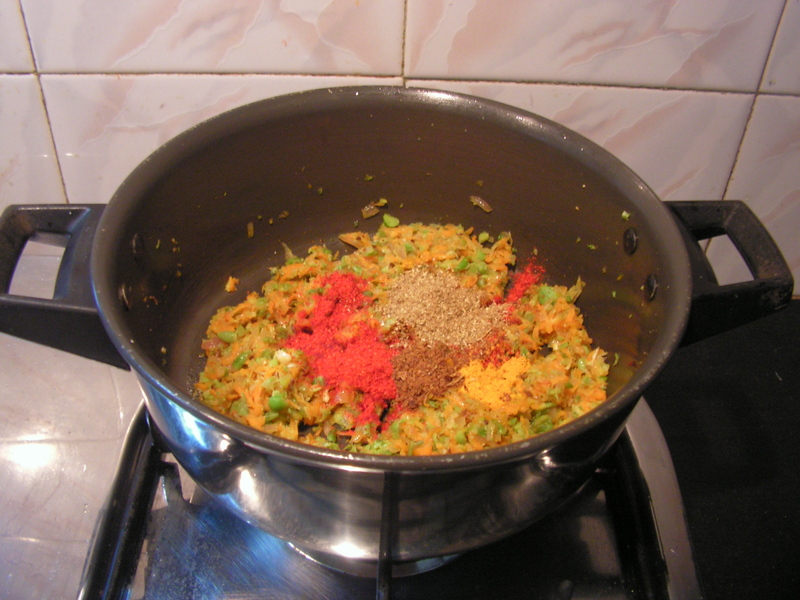 Add cumin and when it splutters add cashews and fry till done. 4. 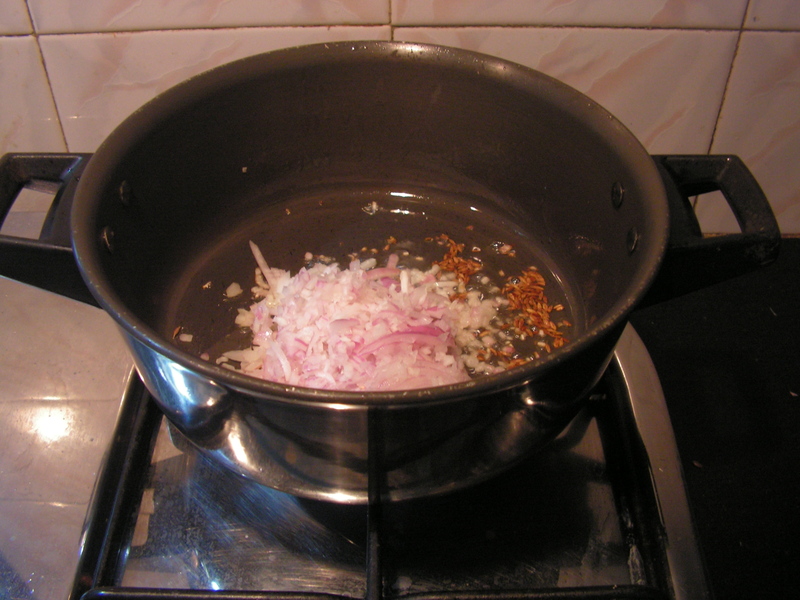 When done, add chopped onions from step-1 to it and also add required quantity of salt to it . 5. 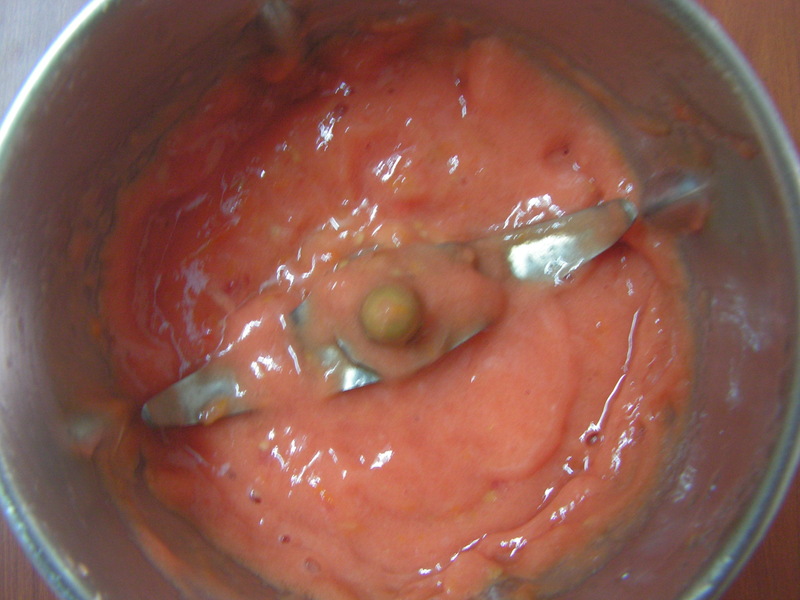 Grind chopped tomatoes, ginger, garlic in the mixer to a fine consistency. 6. 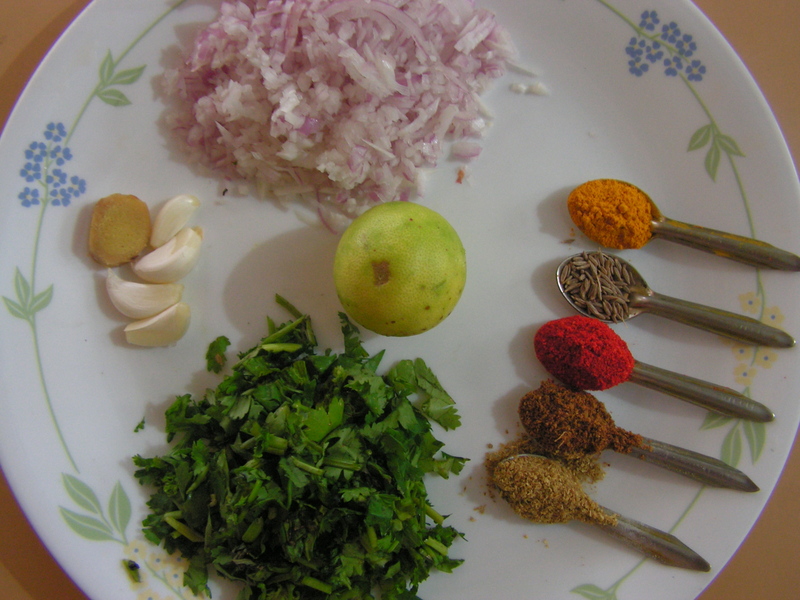 When onions turn transparent add all powders in a row and also the grind masala from step-4 to it and give a strong stir using a wooden spatula. 7. In the mean time place a bowl with 2 and 1/2 cups of water and bring it to boil on the other gas burner. Now add the vermicelli , slit green chili and 2 cups of boiling water simmering the flame and close it with a lid till done. 8. Just open the lid to see if the dish is cooked. Add cooked veggies from step-2 to it . Give a stir with the wooden spatula so that the dish and the veggies is not crushed. Since coked veggie also contains some moisture leave the pan open for a while. It will be almost done by now. 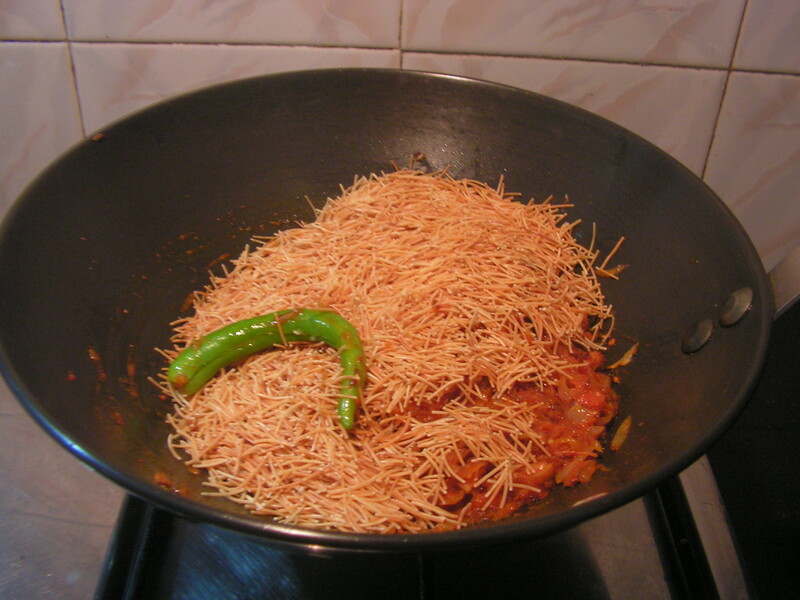 Ready to serve vermicelli biryani is as shown in the image below. 9. Check for salt and transfer it to a serving bowl garnishing it with chopped cilantro. 1. Use roasted vermicelli available in all super markets for better results. 2. 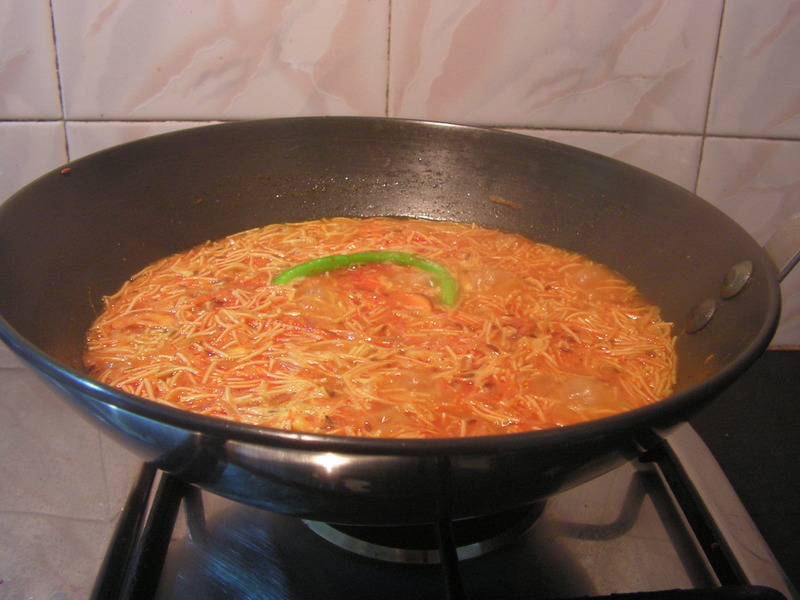 Use boiling water to cook vermicelli since it gives a good texture to the dish. 3. I have used 1 green chili for extra flavour and since the dish was a little blant. 4. I have used home made garam masala powder and hence it is only 1/2 teaspoon since strong. This entry was posted in Uncategorized and tagged 45 minutes, One pot meals, Pulao, Pulav, Semia, Semiya, Sevaiyan, Shevige, Tiffin, Vermicelli.